Rick Riordan has always been a favorite author of mine. Especially when I was first reading the Percy Jackson books (long before I ever started RealityLapse) I followed his blog, read all the books he suggested to read, took all his writing tips, followed him on twitter, the whole wazoo. For those of you who don’t know, the HEROES OF OLYMPUS series is technically a continuation of the PERCY JACKSON AND THE OLYMPIANS series. Click on the links and you can see my reviews of the first book in each series. There are a few differences, both good and bad. For one thing (and something I really miss) is Percy’s voice as the solo point of view. In HEROES OF OLYMPUS, these aren’t Percy’s stories–even though he is a main character. They’re the stories of the time after Percy’s adventures and part of a bigger prophecy. It’s also in third person POV, with a few new characters. There’s a lot of things I love about this series, but honestly I think Percy’s books will always be my favorites out of all the books Rick Riordan writes or has written. That being said however, I believe that Percy fans will also love this series and the ability to see more of Percy and the original crew. My favorite book in this series is still SON OF NEPTUNE, which is about Percy and his adventures during and after the time in THE LOST HERO, the first book in the series. This is where the entire story comes together and things start to make some sort of sense. It was masterfully crafted, and I loved seeing Percy facing an all-new situation with all new people. The world-building, research and stories that Riordan creates are all carefully done and well thought-out without ever seeming wearing. 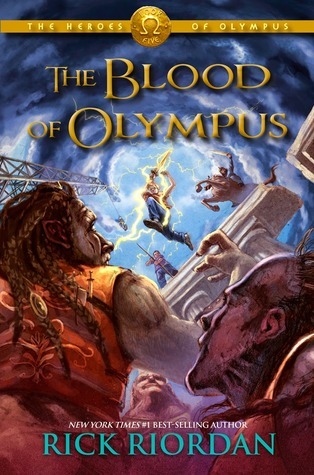 In THE BLOOD OF OLYMPUS, Percy and friends are all going through their own struggles. We get to see the backgrounds of many of the characters, which are all very different and unique but all strangely relatable and connected at the same time. One thing I love about the way Riordan writes it the ability to make all his characters (and his readers, apparently) face their own demons and biggest fears (those cliffhangers….). They have to face their own doubt and self-conflict for the things they’ve done, and that, perhaps, is one of the things I actually admire the most about the way he writes. There are so many things I loved about this book that I can’t talk about without giving away the plot, but I can say that this series is well worth the read. For those of you who have read the series up until this point, there are a lot of things that are figured out well. I can’t say they were the most clever breakthroughs Riordan has ever come up with, but they were logical and worked out well. I can only hope to write as well as him one day. There were a lot of things I couldn’t accept about the characters, one thing in particular that you might know that I’m talking about. I’ve come to terms with it through this book, and I’ve come to realize a lot of things about this character in THE BLOOD OF OLYMPUS. That being said, I also still can’t accept it. I don’t believe in it, and I think that was a mistake Riordan made by changing one of his most solidified characters of the Percy Jackson series in this series. However, I did really enjoy the way this book ended, and I’m sad to be saying goodbye to these characters and this world for future reads. Thankfully, I do own all of them, so I can come back anytime–and it is well worth the ride. I would recommend these books for anyone interested, and even those who are only slightly interested. These are great books that truly break the barriers of genres and audiences. 4.8 stars.